A video documenting The Darkness rehearsing for their forthcoming show at Download 2011 has hit the web and you can watch it in the player above. The video, cunningly titled 'May 2011 Rehearsals', is presented by frontman Justin Hawkins and includes a quick look at their rehearsal space (including their pedal boards), as well as the obligatory footage of grown men with amusing beards larking about. 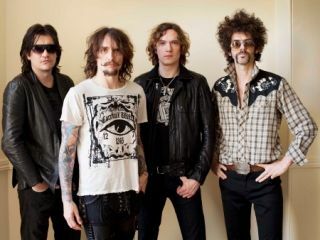 The Darkness make their first post-reunion live appearance at Download festival next weekend (10 to 12 June). Check out our Top 10 Festivals for guitarists for more information.